Click to go to the Beta Reader Forum page. 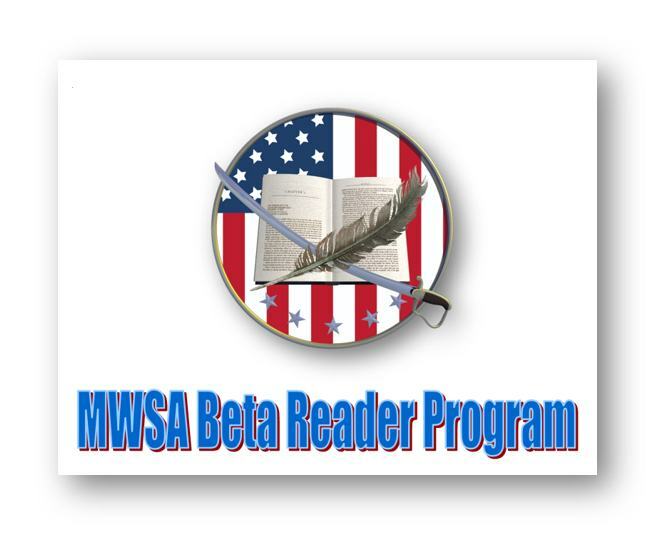 As a new service to our members, MWSA announces our Beta Reader Forum. The idea is to easily expand our authors’ pool of potential beta readers—an important part of our creative process for books nearing completion. As with our review swap program, MWSA is only providing a venue to get authors and beta readers together. Once there, you might also agree to swap reviews once the book is published. The page is available to members only (username and password required). Use this forum to line up beta readers for your book. This is a member-to-member program, MWSA will not monitor any individual agreements made via this system. Paper copy: manuscript, proof, etc. When you'll collect feedback--i.e. your expectation on how long beta readers have to read and provide feedback. Whether or not you'll be posting beta reader names into your book's acknowledgment section. MWSA recommends that authors acknowledge beta readers... and that they allow the readers to opt in or out!